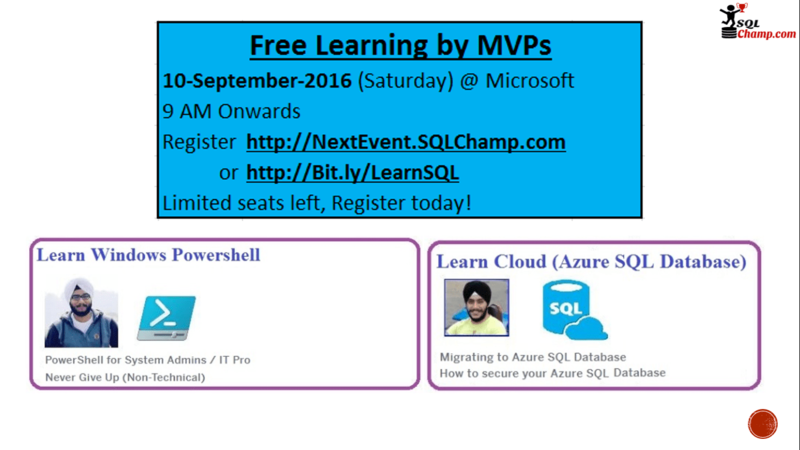 SQLChamp.com and New Delhi Powershell User Group present another event in thier Azure & Cloud Computing series. This time again on popular demand Aman Dhally (Powershell MVP) will join me in these sessions. Abstract: This session will help you understand the process involved in migrating your databases to cloud. It will be a Demo oriented session. Abstract: Are you fed up doing manual tasks again and again? Then it’s time to adopt Powershell in your IT Life. Let’s automate our work and task with Powershell. Abstract: Cloud is the next big thing and almost every organization is moving\planning to move to cloud. But are you 100% sure that the data you move to cloud is secure? There are number of security threats associated with cloud data services so; don’t just rely on your Cloud services provider, the responsibility of securing your data\services is mutual, you must take precautionary methods to safeguard it. Come and join this session to learn how to implement security for Azure SQL Databases. Come and join us about a session on “Never Give Up”. We all know Life is not always fair. In hard time we tend to lose hope and give up. Learn how can we keep ourselves always motivated and on high spirits. Note: Please do bring one Photo Identity proof for security formalities, See you at the event.